We have recently uploaded 36 indicators and 5 outcomes to the Global Value Exchange! These entries have been taken from version 4.1 of the Common Good Matrix. The Common Good Matrix has been developed by Economy for the Common Good to help organisations of any sector or size to improve the positive contribution they make to society. The tool provides organisations with a range of indicators against which their performance can be measured, with each indicator weighted using a points system to reflect its expected impact on society. For example, “Corporate democracy and transparency” is given a value of 90 points, whereas “Promotion of environmentally friendly behavior of employees” has a lower value of 30. A range of indicators which relate to negative impacts are also provided, for example, “Unequal pay for women and men” (which has a value of -200 points). There is a maximum score of 1000 points. A “five-colour Common Good traffic light” can appear on an organisation’s products displaying their score. In future, it is hoped that high scores will place an organisation in a more advantageous position during public procurement processes or entitle them to reduced rates of taxation. The indicators (which can all be accessed here) each relate to one of five categories; Human dignity, Cooperation and Solidarity, Ecological Sustainability, Social Justice and Democratic Co-determination and Transparency. These categories have been chosen based on their importance to the “constitutional values of democratic states”. Each category has been uploaded to the Global Value Exchange as an Outcome, and the relevant indicator entries linked to each. 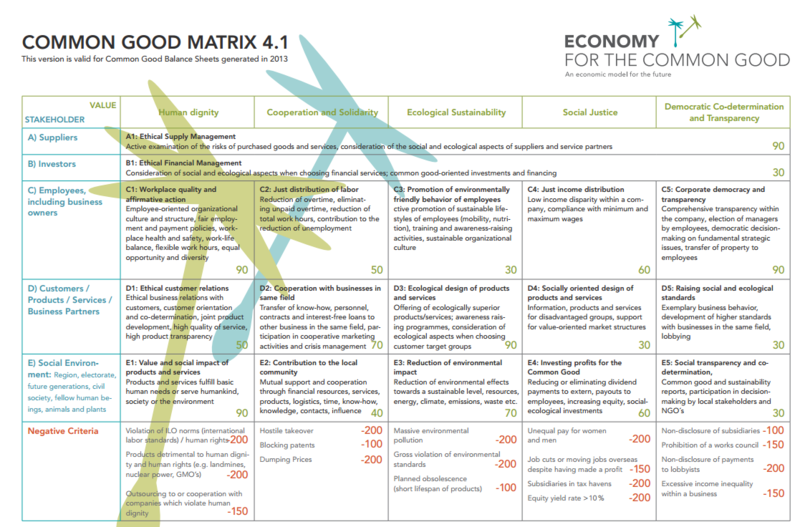 Additional information on each Common Good Matrix indicator is available in the Handbook, which you can access here. This provides detailed explanations of how best to collect, interpret and use the indicators within your own organisation. If you find any of these indicators useful, let us know via email or by leaving a comment on any of the entries we have uploaded.